Antiquarian, date of birth unknown; d. 1603. He was born at Sandon in Staffordshire, his father, Hugh Erdeswicke, being descended from Richard de Vernon, Baron of Shipbrook, in the reign of William the Conqueror. The family resided originally at Erdeswicke Hall, in Cheshire, afterwards at Leighton and finally in the reign of Edward III settled at Sandon. Hugh Erdeswicke was a staunch Catholic who suffered much for the Faith. In 1582 he was reported to the Privy Council by the Anglican Bishop of Coventry as “the sorest and dangerousest papist, one of them in all England”. His son, Sampson, born in the reign of Henry VIII, entered Brasenose College, Oxford, as a gentleman-commoner in 1553. Leaving Oxford, he returned to Sandon where he spent the rest of his life as a country gentleman under the usual disabilities of a recusant. 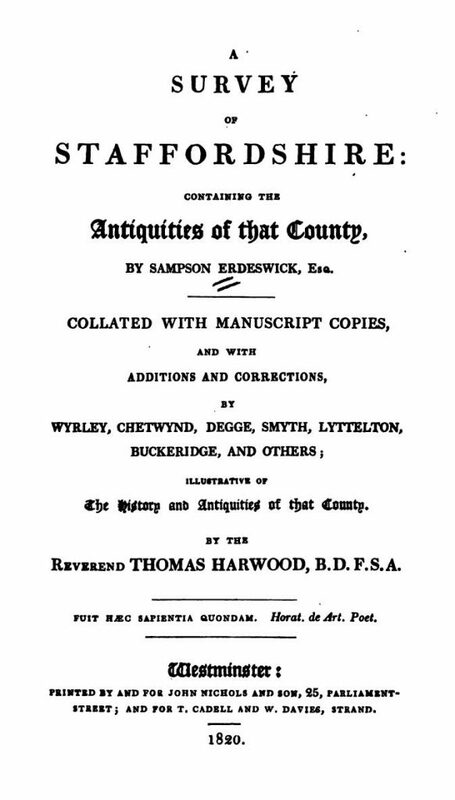 He devoted himself to antiquarian studies, particularly to the thorough “Survey of Staffordshire”. By this work his name is chiefly remembered, but it was not published during his lifetime, and considerable mystery exists as to the original MS., because the numerous existing copies differ much from one another. A description of these was published by Wiliam Salt, F.S.A., in 1844. The “Survey” itself was published by Degge (1717 and 1723), by Shaw in his Staffordshire (1798), and lastly by Harwood (1820 and 1844). Other unpublished MSS. by Erdeswicke are in the British Museum and the College of Arms. Latterly he employed as amanuensis, William Wyrley, a youth whom he had educated and who afterwards published writings of his own. One of these, “The True Use of Armorie”, was claimed by Erdeswicke as his own work, but he told William Burton the antiquary, that he had given Wyrley leave to publish it under his own name; but Antony à Wood denies this, adding that “Erdeswicke being oftentimes crazed, especially in his last day, and fit then for no kind of serious business, would say anything which came into his mind, as ’tis very well known at this day among the chief of the College of Arms” (Ath. Oxon., Bliss ed., II, 217-18). Erdeswicke married first Elizabeth Dixwell, secondly Mary Digby (April 24, 1593). He died in 1603, but the date usually given, April 11, must be erroneous, as his will is dated May 15. He is buried in Sandon Church, beneath an elaborate monument representing his own recumbent figure. Camden and other antiquaries praise his knowledge and industry, and he is believed to have been elected a member of the Society of Antiquaries founded by Archbishop Parker in 1572.